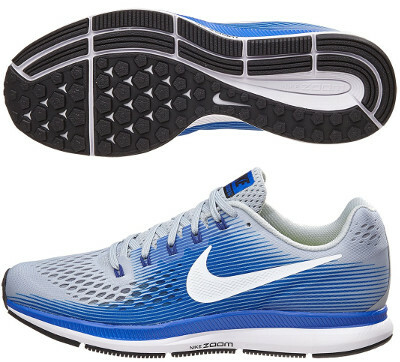 Nike Air Zoom Pegasus 34 are neutral cushioned running shoes. The popular Nike Air Zoom Pegasus 34 hits the market following outstanding hype from the Breaking2 project which naturally includes several running shoes and custom gear. Although current Pegasus 34 was not the running shoe which Kipchoge wore in Monza trying to run a marathon under 2 hours, from the american brand promote it as the selected training shoe for different sponsored athletes like influential Mo Farah. Nevertheless the Pegasus 34 stays true to its rider soul and is a great choice for neutral runners in daily workouts and racing distances up to marathon. Major change besides typical price increase from its predecessor Pegasus 33 takes place in the upper with a double layer mesh (FlyMesh) which not only hides FlyWire cables but also improves breathability with bigger holes in the forefoot. With more room in both sides the classical logo from Nike (Swoosh) takes more relevance in overall design (like in LunarGlide 8) and increases visibility under poor light conditions thanks to its reflective layout. Rest of Pegasus 34 remains the same with abundant cushioning based on extensive Cushlon™ midsole for great comfort and embedded Zoom Air™ units in both rear and forefoot to improve response. Outsole keeps well-known lateral groove (Crash Rail) to properly guide every stride for smooth ride and internal lugs with pentagonal shape provide good traction on any terrain.